Even though I have known my husband for many years before our marriage, I was not aware that he loathed "kadhi khichdi". So much so that MIL warned me that we make one additional dish each time you feel like eating kadhi. 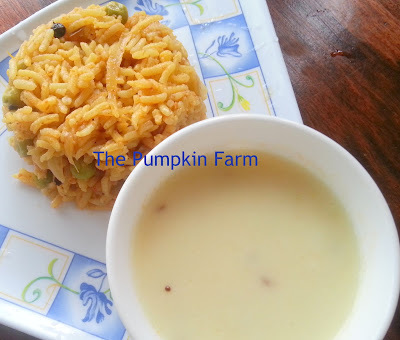 Kadhi at my place was sour spicy concoction of yogurt mildly spiced and served with steaming hot rice. 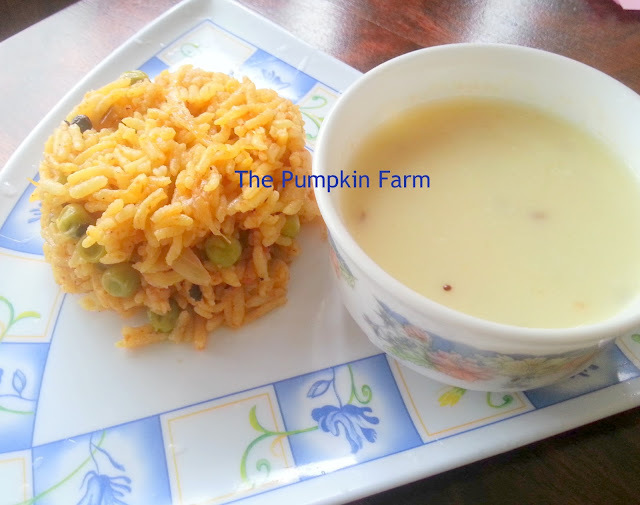 At my inlaws it was a sweet white creamy curry served with mildly spiced mushy rice khichdi. I enjoy it as much as my FIL who can eat it forever without complaining. But then I can imagine my husband's stand who probably wished to eat more contemporary food during his growing years but almost had to do with his father's choice of food as it happens in most houses. I find a midpath to this problem eventually. Whenever we have them over, I make a more spicy pulav version to go with the sweet kadhi which husband can skip if he feels like. This combination works for all..
2) Bring it to boil for 10 or 12 min. 6) Pour this tempering on the kadhi. Haha.. That's so lovely !! A awesome looking combo ! Kadhi pulav looks fabulous, am drooling here. I'm not a big fan of sugar in kadhi, but to be honest it has been a while I tasted Gujarathi kadhi, may be I'll like it now!! Your combo looks yumm!